To many ringers throughout the country, the estate village of Helmingham in Suffolk is synonymous with some remarkable ringing achievements by the local band in the 1930s. During this period the band was made up almost entirely of estate workers representing a wide range of artisanal skills from saddlers to brickmakers. Not only were they first class ringers, but as skilled tradesmen they were also in constant demand and highly regarded for their fine craftsmanship. In a relatively short space of time these modest Suffolk men extended the boundaries of Surprise Major ringing, with over 300 peals in nearly 50 different Surprise Major methods, many of which had never been rung to a peal before. For a time Helmingham was one of the leading 8 bell towers in the country. The bells of St Mary’s, Helmingham, were a gift to the parish from Wilbraham Tollemache, 6th Earl of Dysart of Helmingham Hall, to commemorate victory at the battle of Waterloo in 1815. All eight bells were cast in 1815 by Thomas Mears. Before that date, there were 6 bells at Helmingham, cast by Phelps in 1736, and also given by the Tollemache family. One of these is now hung as the third at nearby Henley. The first peal on the new bells was rung on 12 June 1816. Two days previously the Earl had thrown the park open to the public for a grand opening and first ringing of the bells – and it was a very lavish occasion by all accounts. (Cyril A Wratten (Ringing World 21/28 December 1979) describes that event, to which more than 1,000 people were entertained with ox roasts and ‘suitable’ refreshments). Over 135 ringers attended, and from 9 o’clock in the morning until evening the new bells were rung by various bands from all parts of Suffolk. A special invitation had been made to the band of St Peter Mancroft, Norwich, and they took their turn to ring in the afternoon. It has been speculated that no peal was attempted on that day because of the large number of ringers attending. The peal was scheduled for the following day but sadly it came to grief after an hour and twenty minutes. The day after that, however (June 12), they were successful and a band comprising nearly all Norwich ringers (except for John Naunton of Ipswich) rang 5376 changes of Oxford Treble Bob Major conducted by Robert Chestnutt. Thus began a great tradition of peal ringing at Helmingham which peaked in the 1930s. The photograph shows the Helmingham band in 1936 outside the west door. 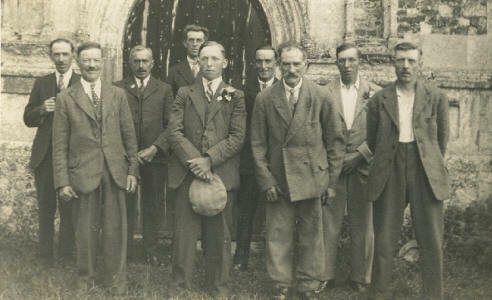 Going from left to right, they are George Whiting (stockman), T William Last (brickmaker), George Bennett (gardener), Leslie G Brett (farmworker), William G Whiting (farmworker), James Bennett Junior (farmworker), George Pryke (saddler and harness-maker), Albert E Whiting (odd-job man) and Leslie C Wightman (carpenter). The Captain of the band was George Whiting who followed in the footsteps of his father Walter and grandfather, Noah. Conducting was shared equally between Bill Last, Leslie Brett, Leslie Whiting, and of course George Whiting. There were other ‘occasional’ band members, all of whom could ring up to London and Bristol; John Arbon, Bill Weedon, Edward (Ted) Lanham and George A Wightman. By the late 20th century, however, the old 2 tier wooden bellframe was beginning to show signs of age and the bells became increasingly difficult to handle. The Helmingham PCC has now decided the time is right to re-hang these fine bells which have witnessed such an impressive history. An appeal has been launched for a restoration project which will re hang the bells in a new frame. The Committee feels that with the Waterloo connection and the nationally-recognised prowess of the earlier peal ringers, Helmingham’s bells deserve to be brought back to their former glory so that future generations of ringers can emulate and improve upon the achievements of their predecessors. They would like to invite ringers to support this project which will cost in the region of £100,000. Donations can be sent to Helmingham PCC c/o Mrs D Haas, Bennau Lodge, The Green, Ashbocking, Ipswich IP6 9JZ. This article has been written with the help of Ruth Suggett, George Pipe and Chris Pickford.